On January 22, 1882, John D. Rockefeller formed the Standard Oil Trust and led Western businesses down the path from personal capitalism to managerial capitalism. As characterized by Chandler, Standard Oil was "the first of the great industrial consolidations" in America and the world. [note 1] As early as the mid-1880s, from its headquarters at 26 Broadway in New York City, Standard Oil's "extensive managerial hierarchy began to coordinate, monitor, and plan for this global industrial empire." Its "interrelated three-pronged investment in production, distribution, and management...made it a first mover on a global scale. [note 2] In the vanguard of businesses blazing a new trail, Standard Oil adopted a policy of extending its managerial hierarchies abroad as well as at home, and it thus might well seem, in retrospect, to have set the stage for a dramatic encounter between Western and Chinese business practices in China during the late nineteenth century. In the event, Standard Oil postponed this dramatic encounter until the early twentieth century. Although the company carried out its policy of establishing foreign affiliates in all of the world's other major markets by 1891, it did not do so in China until more than a decade later. [note 3] In the meantime, in China it surrendered almost all control over the marketing of its kerosene to a sole Chinese agent between 1883 and 1893, and it then took at most indirect control over marketing by delegating authority to Chinese compradors between 1893 and 1903. For these twenty years, 1883-1903, it withheld its corporate hierarchy from China and delegated authority for the distribution of its goods to Chinese social networks. After forming a trust in 1882, Standard Oil appointed a Chinese merchant, Ye Chengzhong, to be its sole agent in China from 1883 to 1893 and left kerosene distribution for China entirely in his hands. Before 1883 Standard Oil had relied on Western trading companies to market its kerosene, which was virtually all burned in lamps for illumination in East Asia, and in the 1870s and early 1880s it had made a very sluggish start in China compared to Japan and the Dutch East Indies. As shown in table 1, by 1880 U.S. exports of kerosene (nearly 100 percent of which came from Standard Oil) included only 97,000 barrels delivered to China compared to 3.3 times more to Japan and 5.5 times more to the Dutch East Indies. By contrast, in 1885, two years after Standard Oil transferred its account to Ye, exports to China shot up to 551,000 barrels--5.7 times more than in 1880--and surpassed the amount shipped to either Japan or the Dutch East Indies. Thereafter, in the early 1890s, exports to China grew steadily, if less spectacularly. Ye was more successful than Standard Oil's distributors in other countries because of the nature of his control over marketing in China. In analyzing the roles played by Ye and other Chinese distributors of foreign goods, it is tempting to characterize them as mere "compradors"--in-house middlemen between East and West--who were marginal figures in China's economy and society, and historians have attached this label to Ye. [note 4] But between 1883 and 1893 Ye reached far beyond the confines of Standard Oil's Shanghai office and managed the marketing of its kerosene every step of the way throughout at least three of China's regions--the Lower and Middle Yangzi and North China. As the historian Hao Yen-p'ing has perceptively observed, figures like Ye should be considered as at least "comprador-merchants", because "the comprador was not only a commercial middleman but also usually an independent merchant in one way or another. "[note 5] Even this designation is not adequate as a description of Ye because it does not convey the large scale of his operation. Before landing Standard Oil's account in 1883, Ye Chengzhong at age forty-three had already created a flourishing interregional chain of shops. Although wealthy at this relatively young age, he had not been heir to a family fortune. On the contrary, his family had been impoverished for several generations, and in his youth his own generation at first seemed equally ill-fated. Born in Zhenhai County, Ningbo prefecture, in 1840, he was only five when his father died, and at eight he received less than six months of formal education in a village school before going to work to help support his mother and his four sisters and brothers. Certainly no scion of an elite family, he acquired his wealth in a remarkable mid-nineteenth-century rise from rags to riches. Thus, despite his humble origins, Ye Chengzhong developed one of China's biggest businesses and used his stores as wholesalers and retailers to distribute Standard Oil's kerosene. He built up this chain of stores and exercised his authority over and beyond it by taking advantage of strong connections with associates from his native place. If Ye's ancestors did not bequeath wealth to him, they did give him a native place that was famous for its members' financial success and subethnic solidarity. Since the tenth century his birthplace, Ningbo prefecture, had been known for producing merchants with commercial acumen and fierce loyalty to their native place, and in the nineteenth century, after Shanghai eclipsed Ningbo as a port, Ningbo merchants created an extensive network of native-place associations that dominated finance in Shanghai and managed trade between the Lower Yangzi and other regions. [note 9] Themembers of these and other native-place associations preferred to confine their dealings to fellow natives from their home localities because they spoke each other's local dialect and expected eventually to return home where the reputations of their families, lineages, and native places were at stake. [note 10] As an heir to Ningbo's long tradition and as a participant in Ningbo merchants' nineteenth-century networking, Ye took full advantage of his native-place connections to manage interregional distribution of Standard Oil's goods. Ye made an effort from an early age to cultivate relationships with Westerners. Before arriving in Shanghai at age thirteen in 1853, he had no preparation for dealing with Westerners, but thereafter he consciously trained himself for the task. On his first job delivering groceries in the French Concession, he began to learn pidgin English, and ten years later, in the early 1860s, after opening his first small shop, he hired instructors to teach him and his staff English, commercial law, and customs regulations at night. [note 16] Through this self-training, Ye learned to deal with foreigners in person and in English, and after becoming Standard Oil's agent in 1883, he regularly used his learning to protect and enhance his position, especially in holding his own against Jardine, Matheson and Company, China's leading British trading firm, which coveted the kerosene trade in general and Ye's account with Standard Oil in particular. Eager to make this "ready sale," Jardine's presented a series of proposals to Ye. Despite Ye's iron grip on China's kerosene market during his ten years as Standard Oil's sole agent, the company finally fired him. It dismissed him on the grounds that he and his Chinese associates had abused their credit privileges and had committed fraud. Between 1894 and 1903 Standard Oil faced its first serious competition in China, but it responded to the challenge by creating only a small-scale marketing system there. In 1893 it belatedly extended its administration for worldwide marketing into China, assigning responsibility for China (and the rest of Asia) to Standard Oil of New York, and this subsidiary, in turn, set up the company's first offices and appointed its first Western salaried sales representatives in China. But these Western sales representatives did little more than transfer responsibility for marketing from Ye Chengzhong to Chinese compradors. The superficiality of this change was evident in the contrast between Standard Oil's approach and the more aggressive tactics of its new rivals for China's market. Between 1894 and 1903 Standard Oil continued to rely on no more than a handful of Western salaried representatives in China. In 1893, on dismissing Ye Chengzhong, it hired British merchants in Shanghai and Hong Kong, provided them with minimal logistical support, and found that they, in turn, delegated authority to Chinese compradors in those two cities and to a foreign trading company in Hankou. In Shanghai Standard Oil chose as general manager of its China headquarters an Englishman named Henry J. Everall. In residence at Shanghai since the 1880s, Everall had studied the Chinese language and had worked in Shanghai for the American Trading Company--a firm later characterized by Standard Oil's in-house magazine as the "repository from which so many of the Company's North China pioneers were drawn. "[note 25] Like other foreign general managers of trading companies, Everall hired a Chinese comprador as a salaried employee to recruit other Chinese employees for the firm and to guarantee their personal integrity and business transactions. In the Middle and Upper Yangzi regions, Standard Oil had no office of its own, entrusting its distribution there to the Hankou office of C. Melchers and Company. This firm was well positioned to market Standard Oil's product because it had opened offices in Hong Kong in 1866, in Shanghai in 1877, and in Hankou in 1884 and had become the biggest German-owned trading firm in China during the late nineteenth century. [note 29] Like other German trading companies, Melchers specialized in opening China's market to newly introduced products,[note 30] and in Hankou it promoted kerosene by taking daring measures not tried by Standard Oil's own offices. For example, after evaluating Chinese commercial houses and designating sales territories for them, it confirmed their appointments as distributing stores (jingxiao dian) by boldly allowing each to take a certain amount of kerosene without making a security deposit. Besides granting credit, it protected the sales stores against price fluctuations between the time of kerosene delivery and the settlement of accounts. If prices rose in the interim, Melchers allowed distributing stores to pay the original (lower) price for the goods, and if the price fell, it allowed them to pay the current (also lower) price. Melchers' commissions to these Chinese distributing stores varied according to each one's volume of business and location and ranged between 2 and 5 percent. Although Melchers' Hankou office was more innovative than Standard Oil's offices at Shanghai and Hong Kong, the combined efforts of all three did not increase the company's sales in Hong Kong and China as fast as its sales were rising worldwide. As shown in table 2, between 1884 and 1894, under Ye's agency, Standard Oil's sales in China as a percentage of its worldwide exports had jumped from 3.5 to 11.3 percent and had risen in Hong Kong from 3.2 to 7.8 percent. Between 1894 and 1903, by contrast, despite its investments in marketing, the company's worldwide exports to China and Hong Kong between 1899 and 1903 slipped downward to an average of 8.8 and 6.6 percent respectively. Meanwhile, as the share for China of Standard Oil's worldwide sales diminished, the American company faced a challenge there from European oil companies. In the late 1890s, compared to American-owned Standard Oil, European oil companies introduced new and more effective techniques for supplying kerosene to China. As shown in table 3, in 1889, with the arrival of the first imported kerosene from Russia, the United States had ceased to be China's sole supplier of kerosene, but before the company's dismissal of Ye Chengzhong and its installation of its own marketing system in 1893, the American share had still amounted to a full three-fourths of the market. Between 1895 and 1904, by contrast, as kerosene began reaching China from Sumatra as well as Russia, the American share dropped from 75 percent to an average of 45.8 percent per annum. Since Standard Oil supplied almost 100 percent of the kerosene exported from the United States to China throughout the period, this decline in the American share deeply concerned the company's management. In 1897 W. H. Libby, Standard Oil's well-traveled troubleshooter for overseas operations, suggested trying "almost anything that would foreshadow and advertise some new and aggressive Eastern policy. "[note 32] In the same year one of his colleagues, F. Q. Barstow, grumbled, "Every day makes the situation more serious and dangerous to handle," and he predicted, pessimistically, "If we don't get control of the situation soon, the Russians, Rothschilds [a Paris-based combine that dominated oil production in Russia], or some other party may. "[note 33] In fact, by 1897 two of Standard Oil's rivals had already begun to "get control of the situation" in China. More difficult, Deterding recognized, was the task of lowering the cost of local distribution within Asia, and he gave it top priority. "The first step I want to take," the thirty-year-old Deterding announced on assuming his position with Royal Dutch in 1896, "is replacing the [Singapore] Straits agents by private employees....I am thinking of a larger and better-regulated sale. "[note 37] In China, as in the Straits settlement, he assigned salaried employees to replace trading companies as managers of kerosene transactions, and by the end of 1897 he established offices in several Chinese cities--not only Shanghai and Hong Kong but also Hankou, Zhenjiang, Tianjin, Fuzhou, Xiamen, and Shantou. Big businesses have faced a persistent dilemma in China since the nineteenth century: how to retain control over corporate hierarchies while adapting to local social networks. 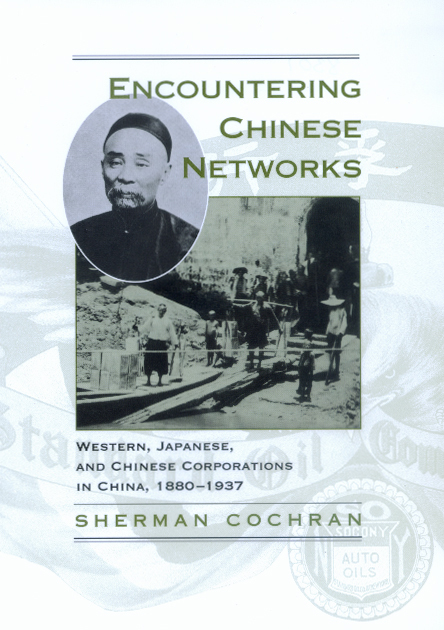 Sherman Cochran, in the first study to compare Western, Japanese, and Chinese businesses in Chinese history, shows how various businesses have struggled with this issue as they have adjusted to dramatic changes in Chinese society, politics, and foreign affairs. Cochran devotes a chapter each to six of the biggest business ventures in China before the Communist revolution: two Western-owned companies, Standard Oil and British-American Tobacco Company; two Japanese-owned companies, Mitsui Trading Company and Naigai Cotton Company; and two Chinese-owned firms, Shenxin Cotton Mills and China Match Company. In each case, he notes the businesses' efforts to introduce corporate hierarchies for managing the distribution of goods and the organization of factory workers, and he describes their encounters with a variety of Chinese social networks: tenacious factions of English-speaking compradors and powerful trade associations of non-English-speaking merchants channeling goods into the marketplace; and small cliques of independent labor bosses and big gangs of underworld figures controlling workers in the factories. Drawing upon archival sources and individual interviews, Cochran describes the wide range of approaches that these businesses adopted to deal with Chinese social networks. Each business negotiated its own distinctive relationship with local networks, and as each business learned about marketing goods and managing factory workers in China, it adjusted this relationship. Sometimes it strengthened its hierarchical control over networks and sometimes it delegated authority to networks, but it could not afford to take networks for granted or regard them as static because they, in turn, took their own initiative and made their own adjustments. In this book Cochran calls into question the idea that the spread of capitalism has caused business organizations to converge over time. His cases bring to light numerous organizational forms used by Western, Japanese, and Chinese corporations in China's past, and his conclusions suggest that businesses have experimented with new forms on the basis of their historical experiences—especially their encounters with social networks. Sherman Cochran is Professor of History at Cornell University. He has written Big Business in China (1980) and has co-authored (with Andrew C.K. Hsieh and Janis Cochran) One Day in China (1983).